Michael McFadyen's Scuba Diving - La Dieppoise Famous for being a little bit of France in the South Pacific, New Caledonia gained a reputation over the years for the arrogance and unfriendliness of the French residents. This reputation was well deserved and led to New Caledonia losing a lot of tourism. In my previous two visits to the capital Noumea, the attitude of the French (as opposed to the Kanaks) was, in my considered opinion, not just cold, but quite hostile. 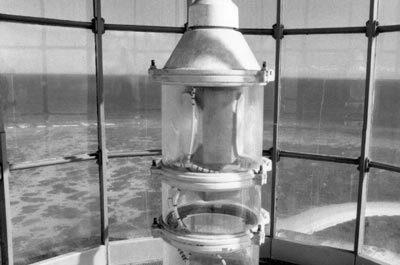 Only 200 metres by 400 metres in size, the island is famous for its metal lighthouse which was manufactured in Paris in 1862. The foundation stone was laid on 18 January 1865 and the light first shone on 15 November 1865. Bernard's dive shop is on the island near the lighthouse. Once you arrive at the island, you gear up on the wharf before transferring to the 6 metre rubber ducky for a 10 minute run to the outside of the famous Barrier Reef. See Boulari Pass for an article about that dive. Another dive near Amadee Island is the La Dieppoise, a French Navy minesweeper that was scuttled only a few minutes from the island. The building of the ship started on 8 June 1951 at the Port Arthur Shipbuilding Yards at Port Arthur, Ontario, Canada (their 107th ship). The new ship was a Bay-class minesweeper, 46 metres long and 8.5 metres wide with a displacement of 390 tons. She was built of aluminium and timber with two diesels powering twin props giving a maximum speed of 16 knots. She was to be a minesweeper. Armament was one 40 mm Bofors gun. She was crewed by a total of 38 men. 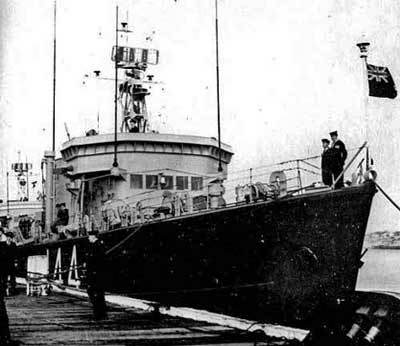 On 21 June 1952 the wife of the Chief Technical Officer of the Royal Canadian Navy, Cons-Admiral JG Knowlton launched and named her HMCS Chaleur Bay. She was commissioned on 18 June 1954 but decommissioned only a few months later on 30 September 1954. On 13 November 1954 she became La Dieppoise, a French Navy minesweeper, M730. She appears to have served in the seas around France from this time till 18 March 1961 when she underwent a major refit in Brest, France. The refit was finished on 26 November 1961 and from early 1962 it appears she moved permanently to the area around Aden and Yemen in the Middle East. On 11 April 1964 she visited the Seychelles and on 13 April 1964 another major refit started, this time in Diego Suarez. This is now called Antsiranana and is at the far northern tip of Madagascar. 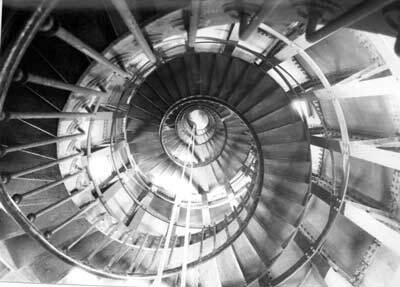 The refit was completed on 14 April 1964. In the coming years she stayed in this area, visiting the north-western corner of the Indian Ocean. 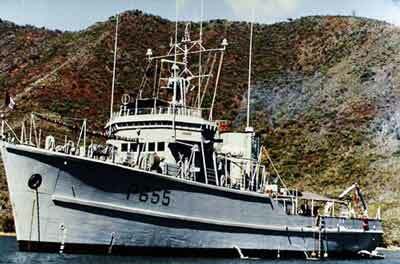 From 1 April to 10 August 1968 she again underwent a major refit in Diego Suarez. 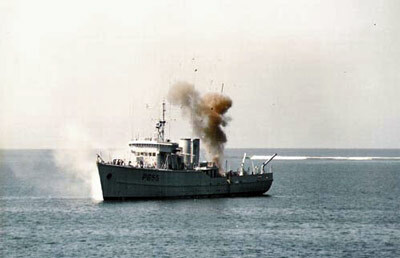 From 1 July to 25 July 1972 she was prepared for a refit which was to transform her from a minesweeper to a patrol boat. This was also at Diego Suarez and was finished on 1 July 1973. 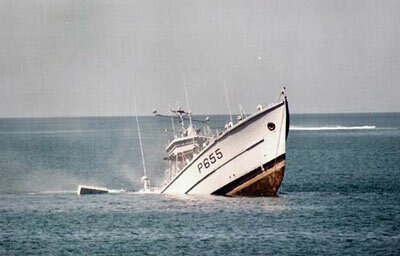 La Dieppoise was now patrol boat P655. She appears to have continued working in the north-west Indian Ocean. About 20 September 1976 La Dieppoise left for the Pacific Ocean where she was to spend the rest of her years. She travelled via Singapore, Bali, Darwin and Cairns and arrived at Noumea, New Caledonia, on 9 November 1976. From here she travelled to Wallis and Futuna Islands and Pago Pago in American Samoa. In early 1977 she travelled to Papeete, Tahiti, French Polynesia, for the elections. After collecting ballot boxes from outlying islands, she returned to Noumea on 8 July 1977. On 5 February 1979 she was stranded on a reef near Amadee Island, Noumea. The tug Noumea eventually pulled her off. She was repaired in Noumea later that month. 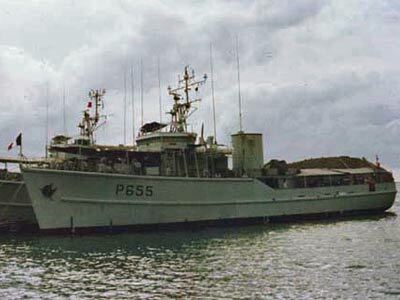 A major refit was carried out from 5 October 1982 till 7 February 1983 in Papeete. In 1983 she travelled to Cairns and on 20 September 1984 she was in Brisbane. On 9 July 1987, at the grand old age of 34 years, she was paid off from the French Navy. 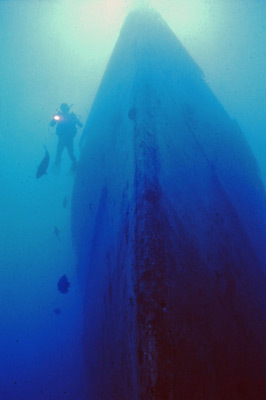 On 19 January 1988 La Dieppoise was sunk as a dive site near Amadee Island, Noumea. Today the vessel sits upright on a 26 metre bottom. The ship, 46 metres long and almost 9 metres wide, has two large props that rest on the sand. La Dieppoise is home to many large fish and they follow you as you examine the holds and hatches. Some easy exploration is possible inside the living areas and bridge. Quite unusually, the ship's wheel is still in place, although the wooden handles are gone, eaten away by borers and worms. NOTE: Underwater photos scanned 2011 from slides taken in 1993. The timber hull is basically intact, but already ravaged by the animals (this was written in 1993), especially above the water line. The rear deck is 22 metres, the front deck 18 metres and the flybridge 15 metres. Soon it is time to finish the dive. As I ascend I see a striped sea snake swim under the other divers and pass into the blue. Back on the island we change into dry gear and tour the historic lighthouse before our trip back to Noumea, What a day's diving; sharks, barracudas, manta rays wrecks, sea snakes. I could not have asked for much more.